Stem Cells for arthritis are everywhere... but are stem cell treatments the real deal for your knee? There are several different aspects of stem cells, growth factors and healing potential. From the maturing athlete standpoint, we are trying to put off the aging process as best we can, and either reverse or at least stem the tide of the wear and tear our activities have taken on our body. Today, I thought we would talk about stem cell treatments for arthritis of the knee. From a non-surgical standpoint, there isn’t anything that we can inject, including stem cell treatments which will magically make arthritis that has developed in our knee simply disappear. Remember, arthritis is not something that is present that we can just scrape away; it is actually the absence of something. That ‘something” is the very important articular cartilage or gliding surface of your joint. That is the smooth, shiny surface we see on the end of a chicken bone, for example, that allow our joint to move smoothly. Once this ¼” thick piece of low friction paint has worn off, we are left with the higher friction of bare bone. This increased friction gliding is what makes us feel stiff before we auto-lubricate by moving around early in the day. By and large, we have four different levels of decreasing the friction in this high friction system. Let me go through each of these from the shortest duration to the longest lasting. We commonly hear the term "cortisone". Cortisone is a 30 year old drug which was a very powerful anti-inflammatory, but had some damaging properties to collagen and cartilage. Very few still use this medication, and it has been replaced with much more user friendly versions that don’t seem to have the same destructive properties. These are also known as hyaluronic acid injections; and you may know them by their brand names such as Synvisc, Hylan, OrthoVisc and the like. Hyaluronic Acid is the normal lubricant in all of our joints; this is present in a lower concentration as we develop arthritis. These injections are designed to lubricate and up-regulate our synovial tissue, to begin forming more of our natural lubricant in a higher friction system. This is the first line of 'growth factors’ that we inject into knees. Our own blood is drawn and then spun down to isolate just the growth factors with the best healing potential and falls under the name Platelet Rich Plasma. PRP has an inherent anti-inflammatory component, and when injected into an arthritic knee, may decrease the pain for up to one year. Usually drawn from either the bone marrow in the pelvis or abdominal fat, these cells can be isolated through a centrifuge process. None of these cells are “smart” enough to be injected and grow new cartilage on their own, however. This bone marrow concentrate (BMAC) can decrease the pain from arthritis for up to two years at a time in the right individual. Can decrease the pain from arthritis for up to one year. Can decrease the pain from arthritis for up to two years at a time. NONE of these will grow new cartilage with a single injection. Don't get fooled into thinking otherwise. Yet they all have the potential for decreasing your pain. The result can be an increase of your activity level through a simple injection for up to two years. Definitely worth looking into, right? Insurance companies tend to pay for the first two (steroids or Visco-supplementation). But not for PRP or stem cells. These last two will often cost more in out of pocket expenses to the patient. WILL THESE STEM CELL TREATMENT METHODS WORK FOR ME? All these methods (including PRP and Stem Cell Treatments) work better in the younger, active person with mild to moderate arthritis. Thy are harder to predict in the patient with more advanced arthritis, regardless of age. I hope that helps! Next time we will talk about these growth factors in the healing of injuries such as hamstring tears, dislocated shoulders, and the like. 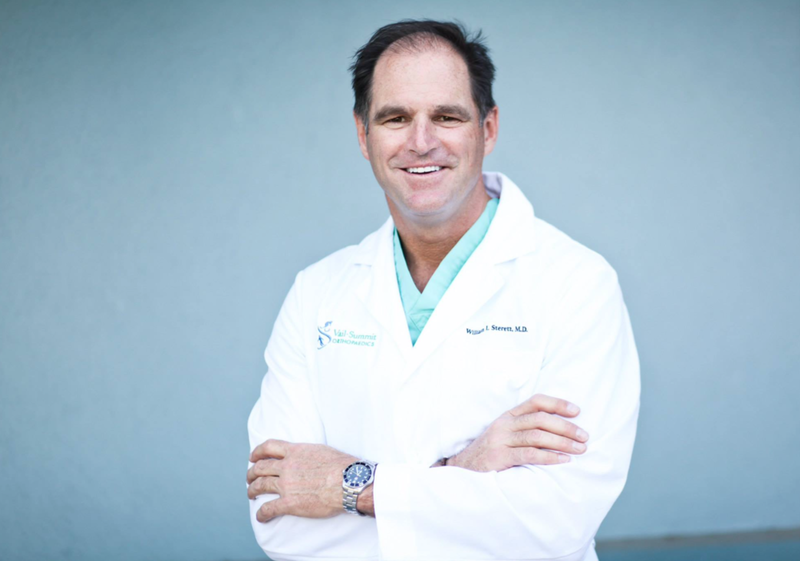 DR. STERETT IS THE HEAD TEAM PHYSICIAN FOR THE US WOMEN’S ALPINE SKI TEAM AND THE MEDICAL DIRECTOR FOR THE VAIL VALLEY SURGERY CENTERS. Looking for information specific to female knee injuries? Visit The Female ACL, the new online resource from Dr. Bill Sterett.